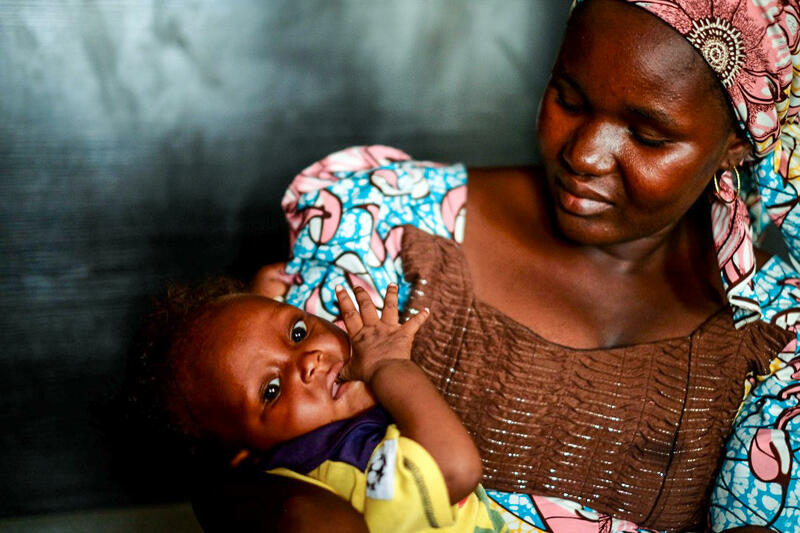 Salamatu Umar, who was forced to marry a Boko Haram fighter, holds son Usman Abubakar. Esther Bitrus, 20, and daughter, Rebecca. She opted to marry a Boko Haram commander, rather than be sold again as a slave. "People call me 'Boko Haram wife' to my face," says Umar. "They say I am the wife of a killer — so how can I be afraid of Boko Haram? They say my son is a Boko Haram baby." Like other girls and young women who have escaped or been rescued, she is learning to cope with the stigma — with the help of counseling. 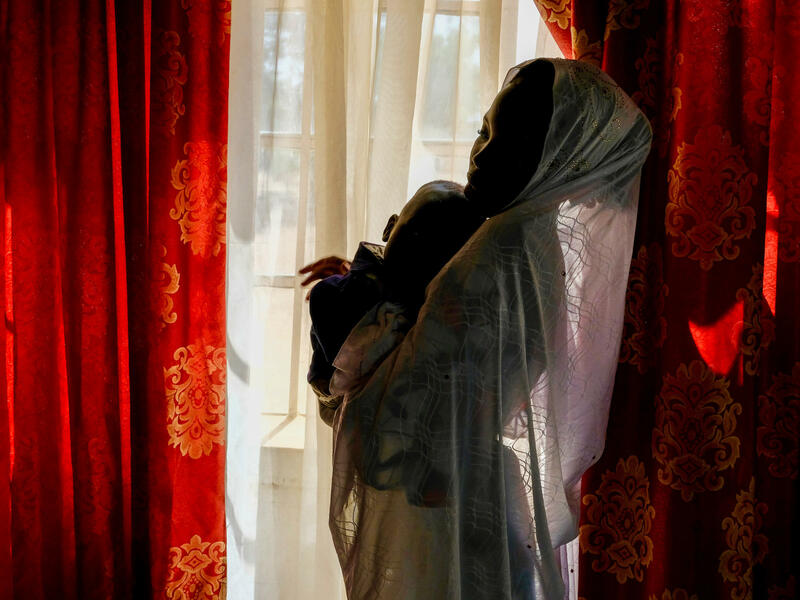 Many of the young women held in captivity by Boko Haram were forced to marry fighters and bore them children, says Hauwa Musa Magaji, a psychosocial counselor who works with the United Nations children's agency UNICEF. "There's a lot of stigma," she confirms. "So it's a big challenge for us, yes. These girls have no fault. The children, they don't have fault. We are talking about a girl that has been abducted, impregnated, and she has given birth to a child. And she's been accepted back by the family, but not her child, not her child." Wearing colorful African print clothing and a long scarf over her head, Umar is open about her own traumas. "I used to feel it would be better to be dead than face all this," she says with a wistful air, referring to the name-calling. "I'm beginning to get over it now, but I still worry. "I'm always happy when I see my child, but deep down, deep inside I'm depressed. "I have lost so much," she says. "I lost my virginity. I have lost my friends. I have been robbed of my childhood." And she wonders, "What man will marry a girl who was once with Boko Haram, even against her will?" As for the so-called marriage to the Boko Haram insurgent, she says, "I don't consider him my husband because, in our tradition, your parents and family have to witness a marriage and give their blessing." Then she has second thoughts. "I suppose it is marriage of sorts, because I have a baby now. But that doesn't make it a proper marriage." Umar looks down at her baby boy and smiles. The former abducted teen mother is from Damboa, a town in Nigeria's northeast, which was overrun by the insurgents. She describes an arduous life in the Sambisa Forest, Boko Haram's hideout where the extremist group drove the thousands of people its fighters kidnapped, including some Chibok schoolgirls, seized in 2014. Umar cooked and cleaned house for many people, apart from her "husband." She says she didn't love him and had no choice but to marry him, but "he was a good man, though misguided," she says indulgently, and she forgives him. Asked whether she shared his extremist ideology — that Western education is sinful, girls should not go to school and that girls and boys should follow only Islamic learning — this was Umar's reply. "He told me joining Boko Haram meant a direct route to heaven, so anybody living with them in the forest would surely go to paradise, so come and join them." "Did you believe him?" I ask. "No, no, I did not," she shoots back emphatically. Magaji, the counselor, introduced me to another young woman who suffered at the hands of Boko Haram and described herself as a slave for part of her time in captivity. Esther Bitrus, now 20, was in high school in her hometown, Vava, when she was kidnapped by Boko Haram in 2014. Bitrus says she was held captive with two Chibok schoolgirls kidnapped in a mass abduction in 2014. "We were three in one house. Two Chibok girls and me. And we were moved from place to place. Then they sold one of the girls and then they sold us. Yes," remembers a spirited Bitrus, who occasionally breaks into English, although she prefers to reply to my questions in Hausa, the regional language. Bitrus, who is Christian, says she was sold to a Boko Haram commander by another commander — Aliu — who was in charge of Gwoza, the seat of the terror network's short-lived "caliphate." Ultimately she was married off to another commander, Galadima, who became her husband, she says. Bitrus is not sure how much he paid for her. Before that, "it was a life of drudgery for a year and three months," remembers Bitrus. She was doing all the domestic work in a Muslim household, which included wives who she says did nothing but accuse her — their slave — of sleeping with their husband. "Then the wives told their husband, 'No more slaves in this house,' " says Bitrus. " 'You either sell her or marry her off to someone else.' "
Her problems were compounded, she says, when one wife caught her kneeling in Christian worship, saying prayers and fasting in desperation at her predicament. "I was beaten by the husband," says Bitrus, "and my life was threatened, with a warning if I continued to pray that way." "When that wife reported me, the husband said if I didn't stop the Christian prayers, I would be killed," says Bitrus. That is when she decided she must escape slavery and marry a Boko Haram commander, who was later killed by a rival faction within the group. Months after, Bitrus and a group of other Boko Haram "wives" and "widows" were rescued by the Nigerian army. Now she is free again. Bitrus wants to pick up where she left off at high school, reunite with her parents, who are currently displaced across Nigeria's border in Cameroon, and raise her baby Rebecca. The teen Boko Haram "bride" Salamatu Umar was in the Quranic education system before Boko Haram captivity. She wants to go to school and learn English — and focus on her infant son, Usman, she says, "to make sure he grows up a good Nigerian citizen." Both these women have been accepted back by their respective families, even though they're currently displaced and living in camps in Maiduguri and are not yet back with their relatives. But many girls and women who've been abducted by Boko Haram and then have escaped or been freed are still grappling with prejudice and jeers by others, like Umar and, to an extent, Bitrus. Some families and communities have rejected such returnees, forcing them to find their own way outside the society they know, with little chance of reintegration. Camps of displaced persons all over northeastern Nigeria are peopled with this forgotten group. Its anonymous members keep to themselves, keep their heads low and battle to survive with their offspring, says Magaji, the psychosocial counselor. Sympathetic to their cause, Magaji says, Nigerian society must do better. Otherwise the girls and women are doubly punished — suffering as captives and then shunned by their community. "Rejecting them will pose another danger," says Magaji. "When you reject such a young girl, she either lives on the street or someone takes her away and she has another pregnancy." The babies face an uncertain future as well. "You know the African way of life?" says Magaji. "You have to know your grandfather. You have to know your grandfather's father. So this is a real problem." She wants the government to "sponsor them to help in their education this is what we are asking for." The two young women I met have not given up hope. "There are other girls in the camp like me," Salamatu Umar says. "But nobody is taking care of us. There are other girls like me who are complaining." I ask whether she would consider becoming a spokeswoman. "I hear you," she says. "Yes, I can do it." Northeastern Nigeria now where the Boko Haram terror network has killed 20,000 people, driven millions from their homes and abducted thousands. Adults and children who survived the eight-year insurgency are beginning to tell their tails. NPR's Ofeibea Quist-Arcton has the story of two young women. OFEIBEA QUIST-ARCTON, BYLINE: Salamatu Umar is 18, a young 18, with a tiny little voice. Umar cradles her 1-year-old son, Usman. She seems like a child herself. SALAMATU UMAR: (Foreign language spoken). QUIST-ARCTON: Umar's son was born out of a forced marriage to a Boko Haram fighter. The teen, a native of Damboa in Nigeria's northeast, recounts her hell at the hands of Boko Haram after her town was overrun by the insurgents in 2014. She was 16 then. QUIST-ARCTON: Umar was 1 of 6 girls abducted by extremist fighters and herded into the bush. Then, she says, "our Koranic religious teacher told us the pride of a woman is to be given in marriage. So he handed all six of us to Boko Haram insurgents." "That's how I came to marry Usman Abubakar," says Umar. QUIST-ARCTON: "But I don't consider him my husband because in our tradition, your parents and family have to witness a marriage and give their blessing," says Umar. "You can't just be given out to somebody you don't know. My parents were not there. It's unimaginable to think that girls are abducted and then married off. No, that's not right," she tells me. QUIST-ARCTON: Then Umar has second thoughts. "I suppose it is a marriage of sorts because I have a baby now, but that doesn't make it a proper marriage," she says. She looks down at her baby boy and smiles at Usman. That's now. The abducted teen mother describes an arduous life in the Sambisa Forest. That's Boko Haram's hideout where the extremist group is said to have driven thousands of people its fighters kidnapped, including the Chibok schoolgirls. Umar cooked and cleaned house for many people apart from her husband who, she says, she did not love because she was forced to marry him. But he was a good man, though misguided, she says. And she forgives him. QUIST-ARCTON: "He told me joining Boko Haram meant a direct route to heaven," says Umar, "so anybody living with them in the forest would surely go to paradise, so come and join them." Umar escaped from captivity with another teen bride after they hatched a plan to run away while collecting firewood for cooking. She says, "I have lost so much. I've lost my virginity. I've lost my friends. I missed my parents and family. And which man will marry a girl who was once with Boko Haram, albeit against her will?" she asks. "I have been cheated, and I will never forget what I've been through." Then there's the name calling. QUIST-ARCTON: "People call me Boko Haram wife to my face," says Umar. "They say I am the wife of a killer. So how can I be afraid of Boko Haram? They say my son is a Boko Haram baby. I used to feel it would be better to be dead then face all this," she says. "I'm getting over it now, but I still worry. I'm always happy when I see my child," she says, "but deep down, deep inside, I'm depressed and grappling with stigma and marginalization." HAUWA MUSA MAGAJI: A lot of stigma, so it is a big challenge for us. These girls have no fault. We are talking about a girl that has been abducted, impregnated. QUIST-ARCTON: Psychosocial counselor Hauwa Musa Magaji works alongside UNICEF, the U.N. children's agency. Magaji says cases like Salamatu Umar's are legion. Abducted girls and young women held in captivity by Boko Haram and forced to marry fighters. Many, she says, become pregnant and have children with these husbands. Magaji mentions another case. MAGAJI: She was sold out as a slave doing all the household work, including the husband, the wife, the children. She was doing all the cooking. And she said the master of the house would also go to bed with her. She is not spared because she's a slave. And if she refused, it is the beating of her life that she will receive. So you can imagine this type of night. It was a hell. QUIST-ARCTON: Magaji is describing the case of 20-year-old Esther Bitrus. ESTHER BITRUS: (Foreign language spoken). QUIST-ARCTON: Bitrus, who's Christian, says she was sold for money by one Boko Haram commander. Ultimately, she was married off to another commander. Before that, it was a life of drudgery for a year and three months, remembers Bitrus, doing all the work in a Muslim household, including wives who, she says, did nothing except accuse her, their slave, of sleeping with their husband. QUIST-ARCTON: Bitrus' problems were compounded, she says, when one wife caught her kneeling in Christian worship, saying prayers and fasting in desperation at her situation. "I was beaten," says Bitrus, "and my life was threatened." QUIST-ARCTON: Seven months pregnant, Bitrus ended up a young widow when her new husband was killed by a rival Boko Haram faction. Her baby daughter, Rebecca, was born after Bitrus and other wives were rescued by the Nigerian military. Now she is free. Bitrus wants to pick up where she left off at high school, reunite with her parents who are displaced across Nigeria's border in Cameroon and raise baby Rebecca. Ofeibea Quist-Arcton, NPR News, Maiduguri. (SOUNDBITE OF ACROMUSICAL'S "BERIMBAU TRIO, NO. 1 'HARMONIA'") Transcript provided by NPR, Copyright NPR.